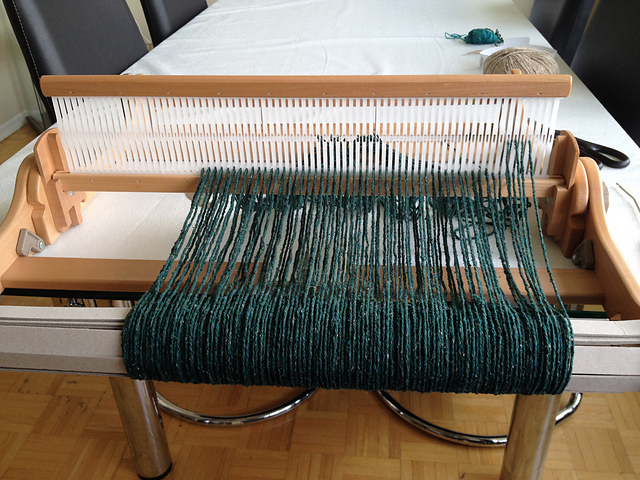 I had not really planned on weaving this weekend at all. 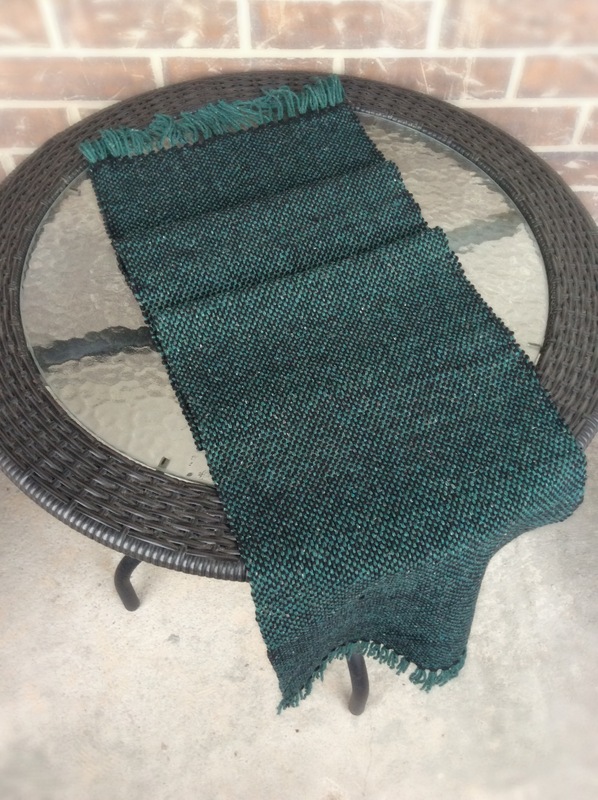 I warped up my loom over a month ago, using my 7.5 dpi heddle and some worsted weight yarn, but had done precious little work on it, to be honest. The reason? I was using yarn I hated and had little use for, because I was “learning/practicing”. I had a ball of Berroco Remix that was given to me as part of a much larger group of items, and I disliked it enough that I had even had it in my destash until that day. So I went ahead and warped up the 216 yards (grossly underestimating how many warp threads I’d actually get from it – ergo the lopsided warping!) and once the leader had been woven in, I had really gotten no further. So I dragged out the loom and got myself set up. I had my hands on the Cascade 220 I had planned to use as weft and wound some onto the shuttle, all the while thinking, “I’ll just do a few passes to get myself used to it again.” Well, that didn’t work half as well as you might think. First, I hated to waste the yarn, even if it was yarn I didn’t like. Worse, I had forgotten just how terrible I was at weaving. This was only my second project and the edges were awful – to use Shireen’s expression, “they looked like the cats chewed on them”. And I could not bear to warp up the loom using something pretty, only to waste it. So I forged ahead and completed the piece. It really only was a few hours at that point. The thing that amazes me the most: soaking is to weaving as blocking is to knitting. It’s quite surprising to see the threads fluff up and the gaps fill in…and to see so much of the unevenness disappear. I did discover one thing. There is a reason that you overlap weft threads when ending one and starting a new one – if you don’t, you get holes/gaps in the fabric. Oops. Lesson learned. Better to learn that on this piece than on something that I’ll be sad about having that sort of flaw. Overall, it actually came out fine. 51.5″ long without the fringe by not quite 12″ wide. I told Chase it might make a nice coffee table runner, or at least I now knew how to go about making one and about how much yarn I’d need. Next onto the loom….a toss up between some Malabrigo sock, a skein of Tanis Fiber Arts laceweight and some Malabrigo Silkpaca lace in Archangel. 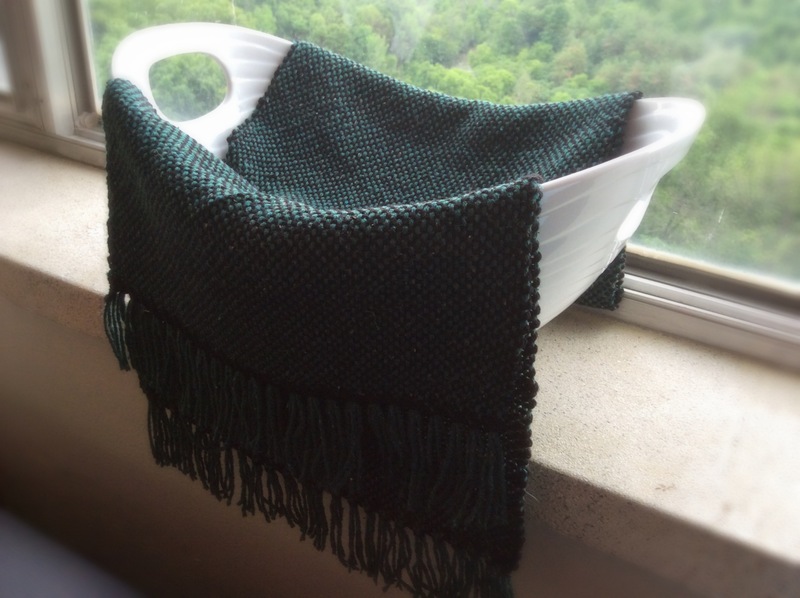 This entry was posted in Uncategorized and tagged 7.5 dpi, ashford, knitters loom, rigid heddle, weaving by Rayna. Bookmark the permalink.